I'm a Rosacea suffer, now i've always had issues with my skin, when i went through puberty i was covered with spots, from head to toe and front to back, My mum tried everything, from putting me on a specific diet to even putting me on sulphur tablets, (don't do it, believe me you'll regret it) to try and help me. But nothing worked, they just went their course and now thankfully they're gone. I used to wear make up, not a lot of it, but enough, I used to cleanse and tone my skin, with a commercial brand, but all that had to change when i turned 30, because anything i put on my face, either turned me into a lizard (my cheeks were covered in very dry scales) or looked like a bleacher beacon (looked like a very red tomato). So when i started making my own skin care, i wanted to make something nice for my skin, something to soothe my face and that worked, granted i still cant wear make up but at least my skin is soft and i don't get the tomato face very often now. But over the years and studying both Aromatherapy & Herbalism i have come to realise its not just about what we put on our skin, its also about hormones and what we put inside our body our digestive system has a lot to answer for when it comes to understanding all kinds of disorders. So what can help Rosacea sufferer's? One of the culprits believed to be at the source of rosacea breakouts, is the bacteria Helicobacter pylori. In a 2001 study, 100 percent of adults with rosacea who fully recovered after antibiotic treatment were found to have antibodies to this bacteria. But Helicobacter pylori is just as likely to be found in people without rosacea. So the conclusion is, that even though this bacteria may not directly cause rosacea, eliminating it plays a major part in curing it. So what does this have to do with liquorice root extract? So! Liquorice root contains a number of flavinoids that prevent helicobacter pylori from multiplying. So when taken internally, it helps to eradicate the need for your immune system to fight this bacteria. You should take 380 to 760mg of deglycyrrhizinated liquorice root 20 minutes before meals. Liquorice root extract has also been included in some creams, to be applied to the skin. This is because it has an anti-inflammatory agent called glycyrrhizinate which soothes and moisturises the skin. If you have it in powder form, mixing it with Aloe Vera gel can make a noticeable difference to any facial redness. Leave it on for about 20-30 minutes. Olive leaf extract is one of the most potent antioxidants on the planet, cleansing and detoxifying your system from pathogens and protozoa. Eliminating these will give your immune system a fighting chance to combat the causes of rosacea. This herb attacks rosacea causes from the inside. If you’re experiencing acne rosacea, then you’ll be interested to learn that the papules and pustules probably contain tiny parasitic mites. Camphor oil has been shown in studies to be effective in reducing the infestation. It is readily absorbed by the skin so you can apply it – but in diluted form. Don’t take it internally. and it has been known to cause irritation in some rosacea patients. May be useful because it has anti-inflammatory and antiseptic properties. Never take it internally. It should be mixed with other natural oils (e.g. coconut oil) and applied to the skin. Some people have reported allergic reactions to it, so be careful using it to start with. Rinse with tepid water. Once removed, splash skin with cold water. Pat dry face. Neem, a tree Native to Southeast Asia and valued highly in Ayurveda, is another centuries-old remedy for skin health. Neem leaf, bark and oil are teaming with anti-inflammatory, anti-fungal, and antibacterial properties, making them excellent additions in skin care formulations. Neem is known to sooth irritation caused by rosacea flare-ups and acne. Neem is also high in vitamin E and rich in essential fatty acids, which boost lipid content and repair the skin’s barrier function. Another naturally occurring constituent of neem is quercetin, which supports the body’s inflammatory response. No wonder neem means “perfect, complete and imperishable” in Sanskrit, as it is quite clear this magical plant harnesses an abundance of healing properties. Aloe, nature’s best hydrator, has been proven a safe, gentle and effective treatment for mild to moderate forms of rosacea. Applying this plant to the skin can result in almost immediate relief from redness and irritation. It’s best to buy pure aloe vera gel (or an aloe plant to break open the leaf) because many over-the-counter aloe vera gels contain chemicals and preservatives that can increase symptoms. Not really an herb, but definitely a miracle, coconut oil is in a kingdom of its own. The benefits of this oil are so plentiful that it really deserves it’s own encyclopedia. In terms of rosacea, coconut oil used topically and internally helps to reduce inflammation and support tissue healing and repair. Several studies have shown that Demodex mites, which exist on the face of all humans, proliferate on facial skin of people who have rosacea. One study conducted in Mexico City’s General Hospital found much greater numbers of these mites in biopsies of the skin in patients with rosacea than in people without rosacea. This is an interesting (though, not surprising) correlation between the positive effects of coconut oil on rosacea due to its anti-parasitic properties. Oatmeal has been used for centuries and offer's a great deal of relief by soothing the skin, reducing inflammation, removing those pus-filled pimples and more. To use simply grind whole oats in a food processor until you have a fine powder. Mix this with a little water to form a paste and then apply to your face gently, do not rub or massage onto the skin, Leave for 10 or 20 minutes and gently wash off and pat your skin dry. Chamomile is not only a nervine but also carminative, antispasmodic, and a great anti-inflammatory. It’s also very soothing to the GI tract, and is often used as an after-dinner tea to ease digestion. One clinical trial reported a significant anxiolytic effect in patients with mild to moderate generalised anxiety disorder that were given chamomile (Amsterdam et al., 2009). 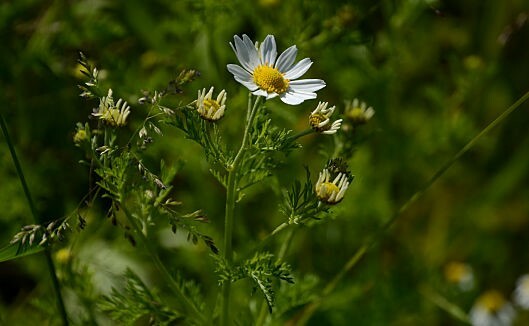 Chamomile has a pleasant taste and is safe for children. Chamomile is also a great external remedy for skin Try using a strong infusion of chamomile tea as a face wash for acne or rosacea, or taking a chamomile bath for inflammatory conditions that are more widespread. Chamomile flowers can also be made into a poultice for smaller areas of skin inflammation. ACV contains a form of natural Acetic acid which is known to help reduce the swelling associated with this condition, balancing the skin's delicate pH levels at the same time. In addition to the natural acids, apple cider vinegar is also packed with trace minerals, vitamins and enzymes that help to set it apart from other commercial vinegar's. However, the most useful benefit of ACV when treating Rosacea is the way it can disinfect skin due to its unique anti-bacterial action.